Chewing On A Rock . . . . Yes, A Rock Posted April 22, 2011. One Happy Coyote!, Posted November 2, 2016. A Newly Discarded Bike Tire Inspires A Coyote’s Inner Child, Posted September 4, 2018. What is Going On With A Coyote Which Appears “Bolder” Than Normal? Posted February 15, 2015. Seeing Larger Number of Coyotes Traveling Together: Need for Concern?, Posted February 28, 2015. Call Of The Wild — In MY Neighborhood? Posted January 25 2016. Territorial Fights Can Be Vicious, Posted October 6, 2018. “Seasons”: Our Glorious Forests (i.e. Habitats) Are Waning, Posted November 20, 2016. Coyote As Totem of America, A New Yorker piece by Ottessa Moshfegh, Posted July 8, 2016. Carl Safina: A Talk at WildCare, Posted October 25, 2017. 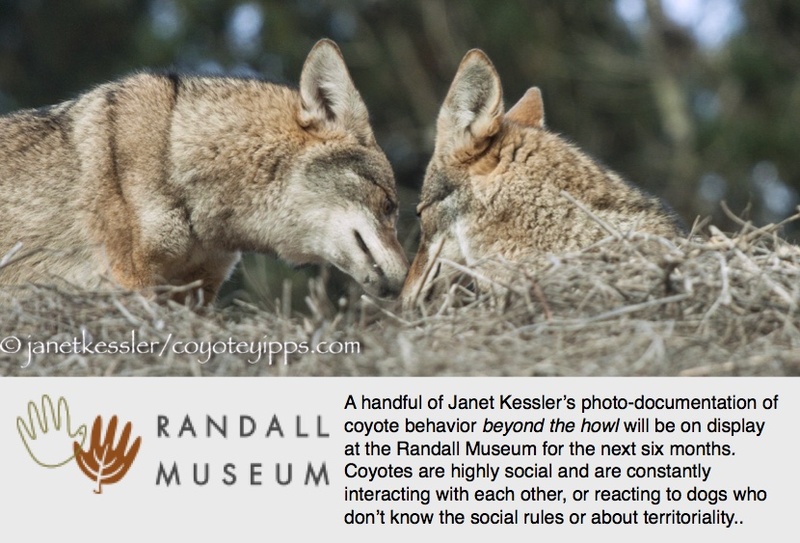 Coyotes: “Beyond the Howl”, an Educational Exhibit by Janet Kessler, Posted January 21, 2018. Just discovered this site and enjoy it. Thank you. The coyotes who pass through our Kentucky farm are good neighbors who hunt mice in the fields. We rarely see them tho our game cameras frequently capture photos late at night. One snowy Christmas morning, we watched from our house as 3 coyotes played on the hill. While the larger coyote – the male? – watched from a few feet away, one bowed to another and they played a little before resuming their trek up the hill to presumably their den. Fascinating to know more about the shadowy neighbors with whom we unwittingly share our land.